You are here: Home / Life / Danger! 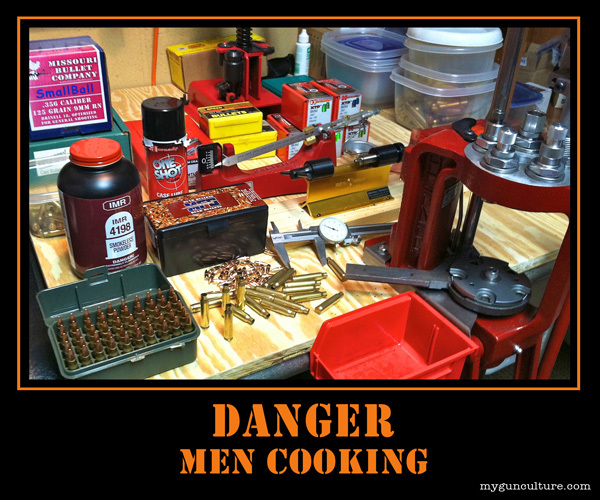 Men Cooking! Tom is the primary author of the Insanely Practical Guides series of how-to books. He believes that shooting can be safe and fun, and works hard to make the shooting world easy to understand. If you want to learn about the world of guns, shooting and the American way, check out some of his books. Have a laugh or two. Life is too short for boring "how to" books. Feel free to visit Tom at his website, MyGunCulture.com. It's a half-cocked but right on target look at the world of shooting and all things related. If you want to learn with a laugh about guns, shooting products, personal defense, competition, industry news and the occasional Second Amendment issue, visit him there. Get our FREE eBook, A Fistful of Shooting Tips! Your weekly subscription will get reviews, tips and a few laughs delivered right to your inbox. Once a week and no spam ever.